Whether you are a high school senior figuring out your student loan package, a college student freaking out about the fact that you owe tens of thousands of dollars in student loans, or a graduate getting serious about paying off your student debt, we can all agree on one thing: Student loans are confusing. There’s so much jargon and so many different terms and phrases that talking about student loans is a lot like speaking another language. And that’s not good when you’re the borrower—because it means that you might not know what you’re signing up for. To make your fight against student loans a little bit easier, we’ve pulled together this quick primer to teach you the basics of student loans. Think of it as an introductory class: We’re not going to get crazy, but what you learn here will help build a solid foundation of knowledge that you can use moving forward. Alright, pipe down. Class is in session. 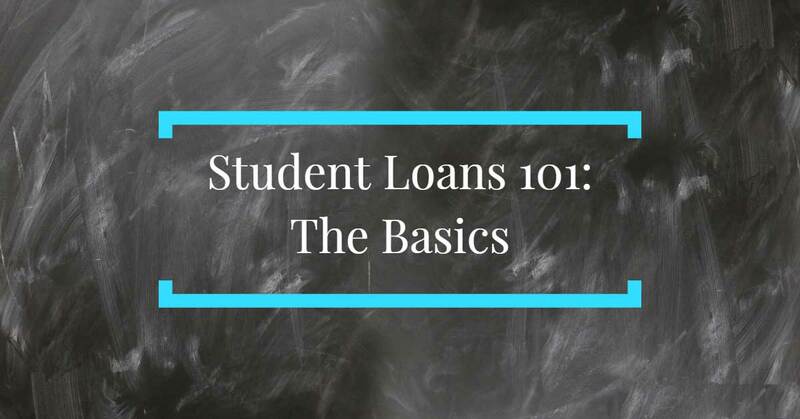 Before we start diving in to specifics about loan types and what you can do to pay off your debt, it’s important for us to just have a general sense of what a student loan is. Lender or Servicer: In this case, it is Navient, but it could be any of a number of other lenders or servicers. Account Information: This includes the account holder’s name and account number, which you’ll need if you ever need to contact your servicer. Total Payment Currently Due: This will show you the current payment that you must make. If you are enrolled in autopay (like I am) then you will likely see $0 in this field. Loan Snapshot: This is a quick summary of your loans including the due date for the next payment, the amount due at that time, and the status of your loan. Total Loan Balance: This s the total amount of money that you owe on your student loans. Note, this may be different from your “payoff amount” (the amount of money you would need to pay to close out your loan). This is because if you pay by check, interest still accrues while your check is in the mail. Clicking into an individual loan will show you a screen like this, which contains the details of your individual loan. Loan Name: This is pretty self-explanatory, don’t you think? If you have multiple loans, they will assign names to your loans to make it easier for you (and them) to manage. As you can see, the name will often contain important details like whether the loan is subsidized or unsubsidized, and what kind of loan it is (if it is a federal student loan). Repayment Plan: This field shows you your current repayment plan. Mine is in “Level” repayment, meaning that I pay the same amount each month for the life of my loan. 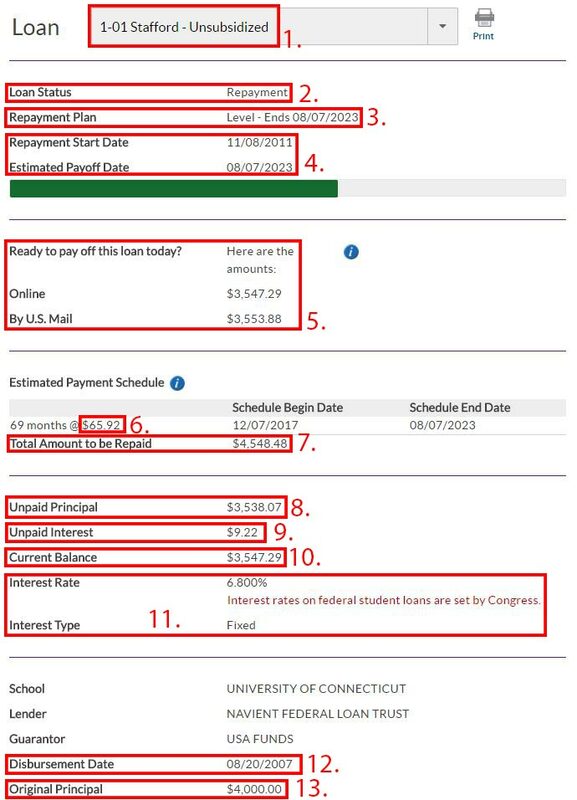 If you are in an income-based repayment plan, then this field will describe your payments. Repayment Start and End Dates: These are the dates that you started making payments on your student loans and when you are expected to make your last payment (as long as you do not miss any payments or otherwise fall off track). Repayment Amount: This is the amount that you must pay if you want to pay off your student loan right now. Making the payment online will be cheaper than making a payment by check, since an online payment is instantaneous while a check must be mailed to your lender or servicer. 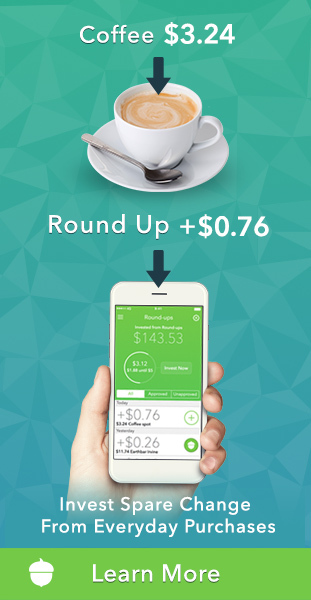 For this reason, you’ll often see two different amounts based on payment method. Monthly Payment Amount: Somewhere on the screen you should see your monthly payment amount. As you can see, this might be buried amongst other information. 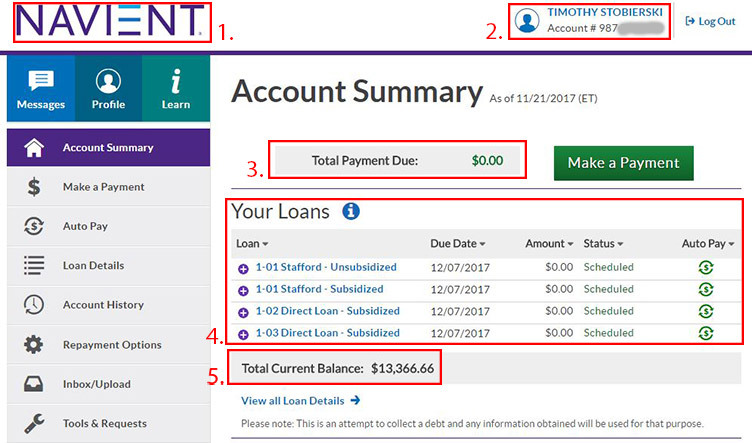 Total Amount to be Repaid: This is the total amount of money that you will pay towards your student loan if you follow your current repayment plan. Changing your payment plan so that you are paying less each month, missing a payment, or placing your loan into deferment or forbearance will all cause this number to go up; paying more each month (or as a lump sum) will save you money and cause this number to go down. Unpaid Principal: This is how much of the original loan (principal) you owe. Unpaid Interest: This is the amount of interest that has accrued on your student loan since your last payment. When you make a payment, it is first applied to the unpaid interest. The balance of your payment then goes towards paying down the principal. Current Balance: This is your unpaid interest plus your unpaid principal. Interest Rate and Type: The interest rate is what you are charged for borrowing your student loan. In this case, my loan has an interest rate of 6.8%. That means that, over the course of one year, I am charged 6.8% of the outstanding principal on my student loan. Interest Type can either be “fixed” or “variable,” which we discuss below. Disbursment Date: This is the date that your loan was originally taken out to pay for your college expenses. Original Principal: This is the original amount that you borrowed, before interest started to accrue. That’s a lot of information, I know. But it’s really important for you to understand exactly what makes up your student loans, or else you’ll never be able to come up with a plan to pay them off. 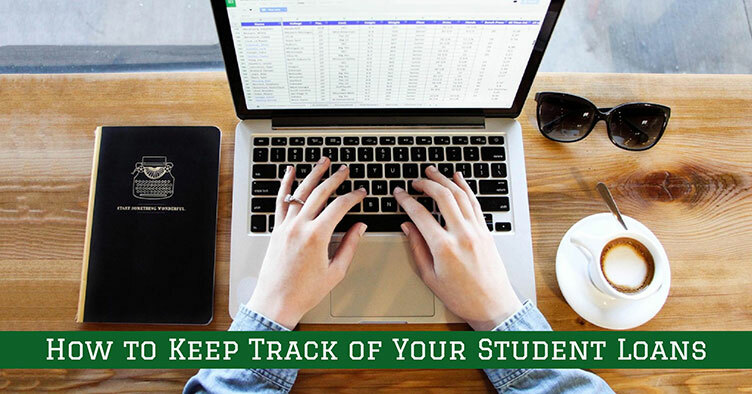 I highly recommend that you keep all of this information in a student loan spreadsheet that you use to keep track of your student loans from month to month: Doing so means that all of the important information about your student loans is in one place, which is really important if you’ve got more than one lender or servicer. Okay, so this is where we have some good news and some bad news. The good news is that if you can learn all of the terms above, then you’ll be able to at least have an intelligent conversation about your student loans. The bad news, though, is that things only get more complicated from here. Why? Because there isn’t just one kind of student loan. You might be used to thinking of your student loans as being a singular entity, but the fact is that there are many different kinds of student loans. You could have loans that are all the same type, or you could have a mix of different varieties. Because different kinds of loans come with different benefits, protections, and costs, it’s important that you understand the kinds of student loans available to you. Broadly speaking, the two main types of student loans you will encounter are federal and private student loans. Each of these categories has sub-types that you should also be familiar with. Federal student loans are lent to you directly from the federal government, with interest rates set by Congress. These rates are typically cheaper than those you’d see on private student loans. To be eligible for a federal student loan, you must complete the FAFSA and await decision regarding your eligibility. You must remember to complete the FAFSA each year that you need aid, not just your final year of high school. Federal loans come in a number of forms based on the government program that they are managed under. Each has its own eligibility requirements and different potential benefits (such as student loan forgiveness, income-based repayment plans, etc. ), so make sure you understand which loans you are signing on for when you accept your financial aid package. The four main types of federal student loans you will encounter are Perkins Loans, Direct Loans, Stafford Loans, and PLUS Loans. Perkins loans are low-interest federal student loans available to both undergraduate and graduate students who have demonstrated exceptional financial need. One of the things that makes the Perkins Loan program different is that your school is actually your lender, which means that you’ll ultimately be making payments to your college (and not the federal government or a lender). Unfortunately, all colleges do not participate in the program, so you should check with your university to make sure that they do. Undergrads can borrow up to $5,500 in Perkins Loans each year, for a total of $27,500. Graduate students can borrow up to $8,000 in Perkins Loans each year, for a total of $60,000 (including any amount borrowed as an undergrad). The grace period for Perkins Loans is 9 months after graduation or 9 months after you stop being a half-time student, at which point you’ll need to begin making payments. Perkins loans are not typically eligible for income-based repayment plans, but may be forgiven under certain situations. Direct loans are available to undergraduate students who demonstrate financial need, and can be either subsidized or unsubsidized (more on this below). Students who are dependent on their parents or family members can borrow up to $31,000 in Direct student loans (and only $23,000 of this can be in the form of a subsidized loan). Independent undergraduates may borrow up to $57,500 in Direct Loans (again, with a limit of $23,000 on subsidized loans). Independent graduate students can hold up to $138,500 in Direct Loans (including undergraduate loans), with a limit of $65,500 for subsidized loans. The grace period for Direct Loans is 6 months after graduation or 6 months after you stop being a half-time student, at which point you’ll need to begin making payments. Direct Loans are eligible for income-based repayment plans and may be forgiven under certain situations. PLUS Loans are designed to bridge the gap if your other student loans do not fully cover the cost of your education. They typically come with higher interest rates than other kinds of federal student loans, though they are still usually much cheaper than private loans. These are technically managed under the same program as the Direct Loan program, but they are a distinct type of student loan. Graduate students who are enrolled at least half-time at a school participating in the PLUS loan program. These are called Direct PLUS Loans. Parents of dependent undergraduates enrolled at least half-time at a school participating in the PLUS loan program These are called Direct Parent PLUS Loans. The lender for PLUS loans is the Department of Education. The maximum amount of PLUS loans that someone can have is the cost to attend their school, minus other financial aid received. Credit history is taken into consideration when determining eligibility for PLUS loans, while it is not for other federal student loans. This means that if you are denied a PLUS loan, you will have to find a private loan to make up the difference in costs. Direct Consolidation Loans are unique in the world of federal student loans for one big reason: You don’t take out or accept a consolidation loan in the same way that you might accept a Direct Loan or a Perkins Loan. Instead, you actually create a Direct Consolidation Loan by combining multiple existing federal student loans into a single new loan. People choose to consolidate their federal student loans for a number of reasons. Primarily this is to make paying back their loans less complicated because managing one larger student loan is, obviously, easier than managing eight or ten smaller loans, each with their own payment, interest rates, etc. The other reason is that consolidating certain federal loans (like PLUS loans) opens up some new benefits that you may have been ineligible for under the terms of your original loan. Your interest rate does not change when you consolidate. 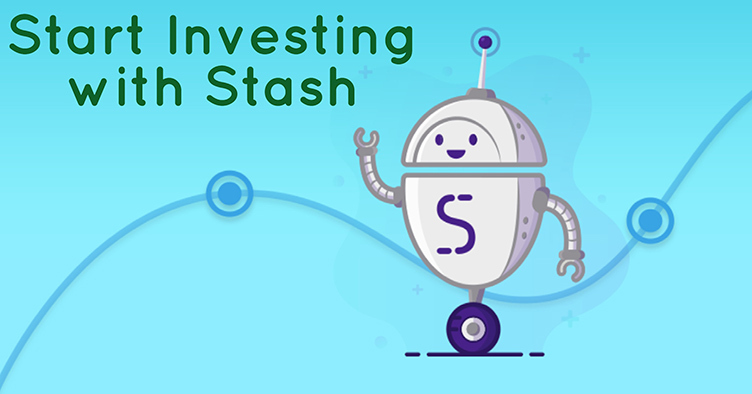 Instead, all of your individual rates and loan amounts are merged together into what is called a new “weighted average” which ultimately means your loans are just as expensive as they were before you consolidated. You might wind up paying more in interest if you opt into a longer payback period. When consolidating your loan, you can change your repayment schedule to up to 30 years (vs. the traditional 10 years). Though this lowers your monthly payment, it means you’re paying more in interest over the life of your loan. Though you may gain some benefits (like access to income-based repayment plans not available to you under your current plan) you may lose other benefits like forgiveness options. If you are currently working towards income-driven repayment plan forgiveness (where you make a certain number of payments and then your debt is forgiven) consolidating your loans will reset the clock back to zero. Also, keep in mind that only federal student loans can be consolidated. Private student loans cannot be consolidated with your federal loans. If you’re thinking about consolidating your federal student loans, be sure you understand all of the pros and cons of consolidation before making a decision either way. Federal student loans generally come in two flavors: Subsidized and unsubsidized. But in the rush and excitement of receiving your student aid package, you probably haven’t given much thought to what the difference is between these two types of loans. That’s a big mistake, because the difference between subsidized and unsubsidized loans can cost you thousands of extra dollars in interest as you pay off your student loans. The differences between subsidized and unsubsidized student loans generally revolves around the way that interest accrues, with subsidized student loans being much more favorable for your wallet. In short, subsidized loans don’t accrue interest while you are enrolled as a student or at any point that your loans are in deferment. Unsubsidized loans do accrue interest during these times, which means that unsubsidized loans will cost you a lot more money over the life of the loan. This is especially true if, at the end of your college enrollment or period of deferment, you cannot pay the interest which has accrued. At that point, the interest is capitalized (or, added to the principal) which means that you will be paying interest on top of your interest. No bueno. If you’ve got both subsidized and unsubsidized student loans, keeping everything in check and creating a repayment strategy might seem really overwhelming. Ultimately your payment strategy will depend on your own financial circumstances and long-term financial goals, but there are a few things that you should keep in mind. 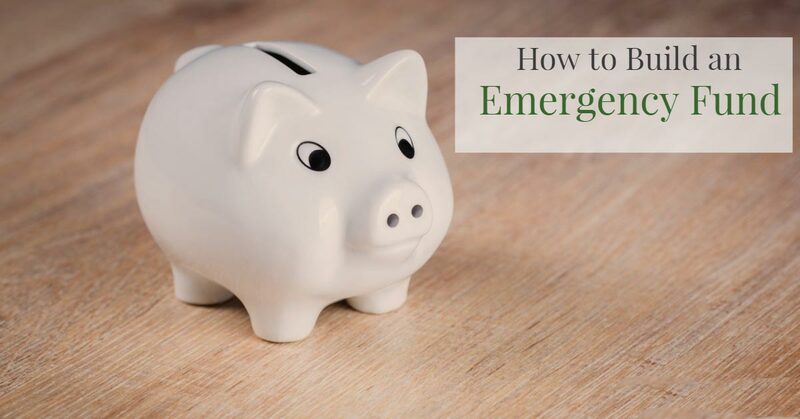 To save as much money as possible it’s important to avoid interest capitalization, which is most likely to impact your unsubsidized loans (subsidized loans will only accrue interest during periods of regular repayment or during a period of forbearance). 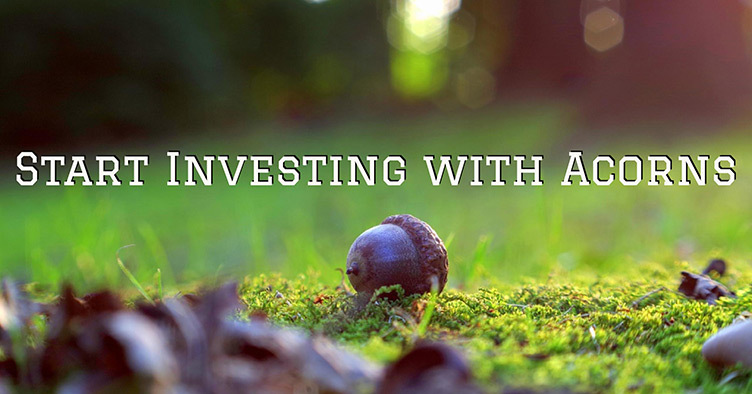 You can reduce the impacts of interest capitalization by working while you are enrolled in school and using that money to pay down your student loans while you are still a student to cover the interest that is accruing. You can also do this by trying your best to not place unsubsidized loans into deferment. Instead of deferment, look towards income-based repayment plans as a way to make payments easier. 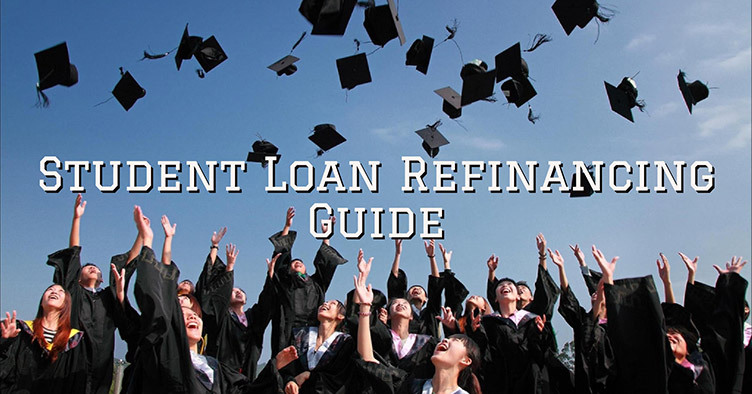 If you do place your unsubsidized loan into deferment, the interest that accrues, especially if it capitalizes, can easily add thousands of dollars to your balance. While federal student loans come directly from the federal government, private student loans come fro a lender like a bank. Because these lenders are for-profit institutions (they want to make money) private student loans typically will carry a higher interest rate than a similar federal student loan. This means that private student loans have the potential to be much more expensive in the grand scheme of things. 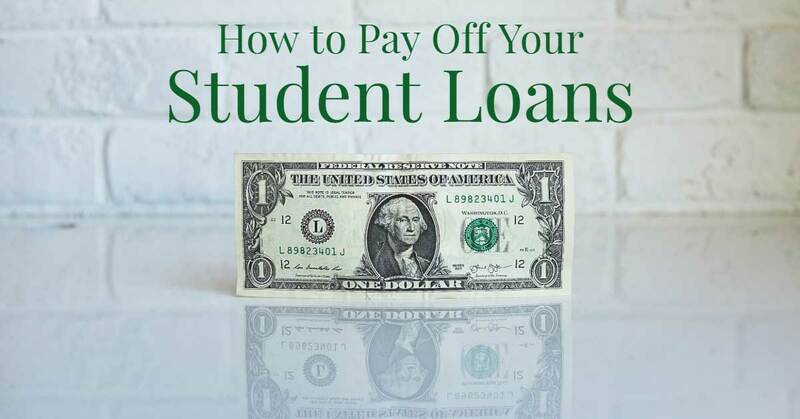 Also, whereas federal student loans come with a number of benefits including access to deferment and forbearance options, income-based repayment plans, and potential student loan forgiveness, private student loans come with none of these options. Private student loans can either be fixed-rate loans or variable rate-loans. Variable interest rates often start out lower than fixed rates, which makes them appealing to borrowers. But, because variable rates are tied to the prime rate set by the Fed, they can (and very likely will) change. The prime rate has been at historic lows for a number of years, but is expected to start rising soon, which means that a low variable interest rate now will very likely wind up being more expensive in a few years. Fixed interest rates, on the other hand, do not fluctuate. For this reason, they are often a bit higher than variable rates. The added cost comes with a benefit, though: Even if the prime rate rises, your debt will never get more expensive so long as you have a fixed rate. It remains the same from the day you first accept the loan to the day you make your final payment (unless you choose to refinance). I personally always recommend individuals choose fixed-rate loans over variable-rate loans, simply because I think it’s best to know up front what the cost of your loan is going to be, and variable rates don’t let you do this. But this is a decision that each borrower will have to make on their own. Which are better, federal or private student loans? Getting your financial aid package after submitting your FAFSA forms is both an exciting and nerve-racking experience, and for good reason: It feels a lot like your entire future is contained in those forms. But on top of that, it can also be overwhelming. You don’t know anything about student loans or financial aid. How are you supposed to know which funds to accept and which ones to avoid? Which Loans are best? In what order should you accept your financial aid funds? Want to learn more about the financial aid process? 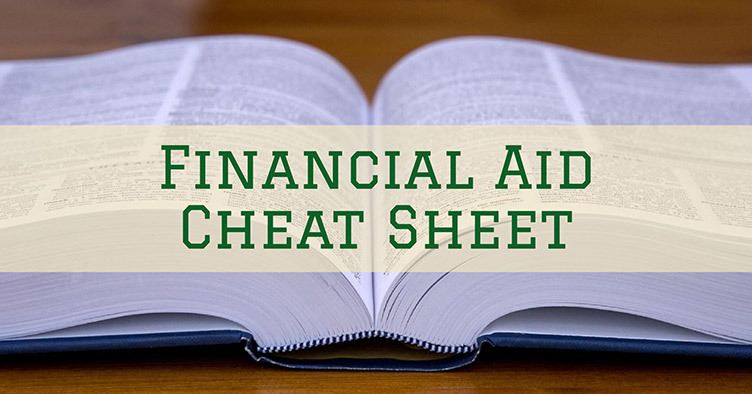 Check out our Financial Aid Cheat Sheet & Glossary with all the definitions and tips you need to navigate the complicated financial aid process. 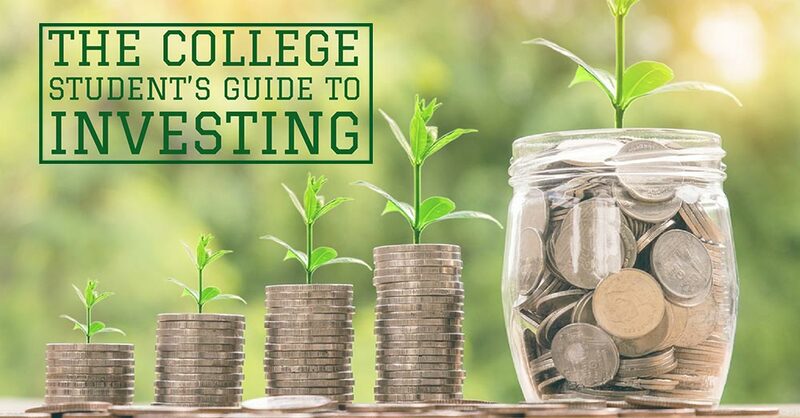 When it comes to accepting your financial aid, you might just want to accept any and all funds that are offered to you so that you can afford to go to college. That’s understandable, but it’s not the best course of action. There actually is a right and wrong way of accepting your financial aid funds. Want to make sure that you graduate college as cheaply as possible? Then accept your financial aid funds in the following order. Remember, accept only as much funding as is absolutely necessary: If you borrow student loans, you’ll have to pay them all back! Federal Work Study Funding should be accepted second, as it is interest-free money. Yes, you’ll technically be working for it, so it isn’t free money. But if working 15 hours a week while you’re in school lets you graduate from college with fewer (or no!) student loans, then that’s what you should do. Just make sure you actually use the work study funds to pay for your education and not bad beer and greasy pizza! Federal Subsidized Student Loans should be accepted third, because they will not accrue interest when you are in school or when your loans are in deferment. This makes them much cheaper in the long run than other kinds of loans. Federal Unsubsidized Student Loans should be accepted next, starting with Perkins Loans if you qualify (since they come with the lowest interest rate) and ending with PLUS Loans (since they come with the highest interest rate). State-Sponsored Supplemental Loans should be accepted next, if they are available to you. 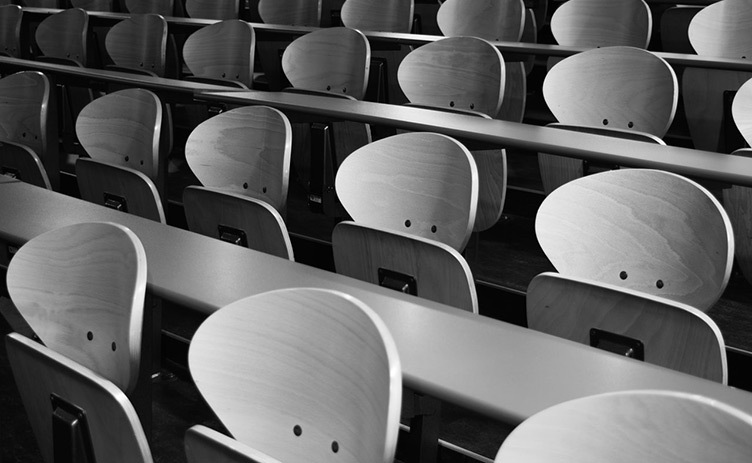 Some states offer supplemental education loans to students to help them fill gaps not covered by federal student loans, which can allow students to stay away from the expensive and often predatory private student loan marketplace. An example of such a state-sponsored loan program would be CHESLA supplemental educational loans available to students studying in Connecticut. Private Student Loans should be accepted as a last resort, because they will have the highest interest rate and the fewest borrower protections and benefits. For a much more detailed and nuanced explanation of how you can succeed in paying off your student debt, check out this student loan game plan that I wrote (and that I’m following). Okay, so that concludes our class on the basics of student loans. By understanding the concepts discussed here, you can begin to understand more fully the complicated world of student loans so that you can crush your debt and live a happier life free of student loans.